High bilirubin levels in a newborn are common and can cause kernicterus and permanent brain damage if not properly monitored and treated. A little boy has permanent brain damage because his physicians postponed simple tests and treatments for a common blood condition. Tiser Lusk suffered from kernicterus, which is a condition that occurs when there is too much bilirubin in the blood. Bilirubin is a by-product of red blood cells being broken down in the body. Babies are not able to easily get rid of bilirubin. Kernicterus occurs when the level of bilirubin is so high (hyperbilirubinemia) it moves out of the blood and into the brain tissue, causing brain damage. Bilirubin is highly toxic to brain tissue, which is why babies at risk for high bilirubin levels should be tested frequently. Testing and treating high bilirubin levels is very easy, and there is no excuse for kernicterus to occur. In baby Tiser’s case, his physicians did not treat his high levels of bilirubin soon enough. Tiser spent seven weeks in a newborn intensive care unit, and he had jaundice, which is yellowing of the skin caused by high bilirubin levels. The medical team thought Tiser’s high bilirubin level had resolved. When they realized it had not, it was too late. Tiser had permanent brain damage. Tiser’s parents, Daron and Mary, had noticed that something was wrong with little Tiser as soon as he came home from the hospital. They spend 16 months trying to determine what caused him to have problems. They ultimately got answers from Dr. Steven Shapiro of Children’s Mercy Hospital in Kansas. Tiser is deaf and has problems seeing. His development is more slow than other children his age, and his muscles don’t work properly so he can’t sit up on his own. Tiser can hear with the help of surgically implanted hearing aids, and he does intense physical therapy. Although Tiser got a late start with therapy, he is making progress. He can reach and grab things, and he has started to roll over. Dr. Shapiro has been researching kernicterus since 1982. He started seeing patients in the 1990s after what he calls a “mini-epidemic” of the condition caused by short hospital stays for otherwise healthy newborns and a false sense hope from phototherapy treatment. Now, Shapiro notes, physicians specializing in treating newborns often diagnose the condition very quickly after birth. This is when diagnosis should occur, which is why newborns need continuous monitoring of bilirubin levels. Shapiro and colleagues are also studying whether deep brain stimulation and stem cell treatments could help children with kernicterus. Deep brain stimulation is used for adults with movement disorders such as Parkinson’s disease. Stem cells are a common treatment for blood disorders. Mary and other mom’s are helping to raise money for Shapiro’s project, and Mary hopes that treatment will be ready for children by the end of next summer. Shapiro plans to test his treatments in rats. He estimates that the studies will be underway in about a year. Human trials could start six months or a year after researchers analyze the animal study results. If successful, both could help people improve muscle control, which affects whether children can walk, talk and do everyday tasks. It is very important for physicians to remember that when clinical signs for bilirubin induced neurological damage occur, it is not too late to treat the baby. This is because when an infant is jaundiced and signs are present, damage is continuing to occur. The sooner the bilirubin is reduced, the better. Hyperbilirubinemia is a medical emergency, and delay makes damage worse. Brain damage from kernicterus can cause cerebral palsy and intellectual disabilities and developmental delays. Not believing the bilirubin level from the lab and delaying treatment while it is repeated. It is okay to repeat the test, but treatment should not be delayed while waiting for the repeat test. There are no negative effects of treating with a large dose of phototherapy, gavage feeding, and hydration, or of ordering a type and cross match and blood. If the bilirubin drops rapidly to a relatively safe level, and the child has no symptoms, the exchange transfusion can be cancelled. Postponing treatment or interrupting phototherapy for diagnostic testing to determine the risk of an exchange transfusion. If a sepsis(infection) workup is needed or an echocardiogram, etc. is needed, it can be done under the lights. If the baby needs to go for an outside test, the lights can go with her. Failing to examine the baby for signs of acute kernicterus, which include lethargy, decreased feeding, extremely tense muscles, limp body, a high-pitched cry, spasmodic torticollis, setting sun sign, fever and seizures. Measuring the bilirubin and failing to compare it to hour-specific norms. This is very important. A bilirubin level in a one-day-old may be normal or dangerously high, depending on whether the baby is 24 or 47 hours old. When physicians and the medical team act negligently and fail to follow standards of care in diagnosing and treating high levels of bilirubin, it is negligence. If this negligence causes cerebral palsy or other neurological damage in a baby, it is medical malpractice. In addition, if the physician causes the baby to have hyperbilirubinemia, and this leads to brain damage and cerebral palsy, medical malpractice occurred. 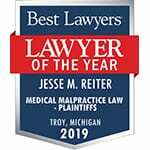 The nationally recognized lawyers at Reiter & Walsh ABC Law Centers have many years of experience in kernicterus cases. If your baby had jaundice and suffers from cerebral palsy, intellectual and develepmental delays or other injuries, we can help you. Our skilled attorneys have decades of experience in kernicterus and cerebral palsy cases and will work tirelessly to obtain the compensation you and your family deserve. Call us at 888-419-2229 for a free consultation. my child was confirmed to be having kernicterus post exchange transfusion. Thank you for your comment, Matebatso. You will be contacted by a member from the Reiter & Walsh, PC team. Please reach out with any additional questions or concerns. We’re sorry to hear your son was diagnosed with kernicterus. Someone from our team will reach out to you shortly to assist.